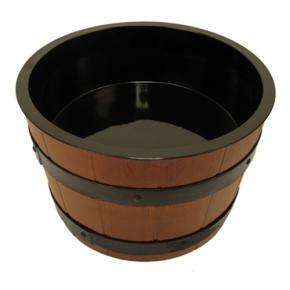 This Barrel Bowl creates a wooden rustic effect for your presentation. The bowl is extremely versatile: it can be used for both food and drink presentation. Furthermore, the collection has two liner inserts, giving you the flexibility when it comes to quantities to use in your display and thus ensuring your display always looks full. Keep your food fresh and protected with the clear acrylic lid we have available for the bowl. The lid has a cut out which is perfect for holding your utensils for easy service. Barrel Bowl Set. Includes 10 Litre Bowl And 4.5 Litre Black Liner. Lid Not Included.